8mm Straight Bayonet with70mm Box Kit - GAS IT Leisure Gas Bottles, Gas Cylincers and Gas Tanks - Catering, Motorhome, Campervan, Caravan, Farrier and Road Repair Refillable Gas Solutions. Complete Round 70mm Filler Box with Straight 8mm brass fixed fill point in Black. This 70mm Round Fill box housing comes complete with lid and a UK 8mm straight fixed bayonet which is a high quality fill point designed to be used with 8mm Thermo plastic or Copper fill pipe. It allows simple filling by just removing the lid and inserting the gas fill gun directly on the fill point inside. The lid comes with a retaining strap and the wording Autogas in the handle. Installation is simple, all that is required is a 70mm hole to be cut ( we sell the cutter in our install tool section ) where you want to fit this and the fill box separates and sandwiches the metal skin between the 2 parts. Fixing screws are provided. If you are installing this body mounted fill box within the living accommodation you need to seal this box off with the GAS IT Angled rubber boot, 30mm Vent tube and 30mm Floor vent as listed on our web shop. Visit our GAS IT technical page for more information. We don't recommend using a fill point with a steel adaptor as this does lead to leaks. 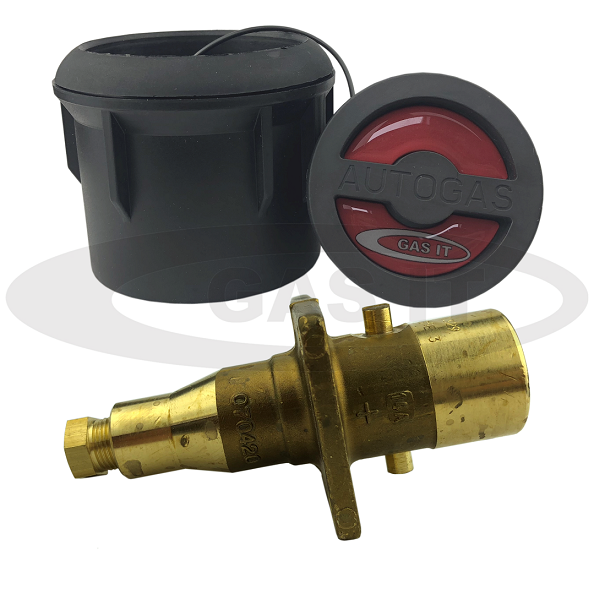 This fill kit is identical to the ones sold by Gaslow, Autogas 2000 and works with all their products.